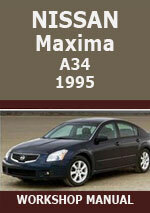 This Nissan Maxima A34 Workshop Repair Manual is an absolute wealth of information that will help any home mechanic or professional technician repair their Nissan. Please note this is for the Northern USA version. Workshop Service Repair Manual $4.99 Immediate Download!